This is a simple and healthy Ice Cream alternative. The main catch is that you need a very powerful blender, such as a VitaMix. With the Vita Mix, I just add frozen mango cubes and a small amount of vanilla almond milk. I use the tamper to push the fruit down and blend it, quickly. 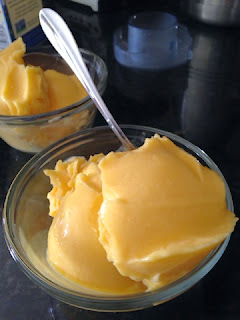 In less than 3 minutes, we have sorbet. This is even tastier with a little honey or sugar added in, but we had no trouble enjoying ours without added sweeteners. Next time, I am thinking some banana would be a great touch!